It’s a new year and we’re all busy making internal notes to self about the ways we’re going to improve. As a writer, much of my job is to persuade. Whether I’m tasked with writing a piece that informs, sways an opinion, pushes a product or just seeks to gain general agreement about an idea—the methodical root is the same. I need to move an audience to act on my intended outcome. And in all my years writing professionally, there is one constant: every attempt at this persuasion begins with writing a simple, yet effective headline. Headlines used to be all about witty and clever phrasing in order to make the line more memorable. Play on words, idioms and clichés used to fill the toolbox of any seasoned advertising copywriter. However, since today’s consumer is more likely to peruse their social feed rather than a magazine filled with print ads, the methodology of headlines has changed. Don’t get me wrong, wit and humor are still important qualities of any headline, but now more actionable and engaging phrasing is required to get readers excited about interacting with a social post. Unfortunately, there’s no secret formula or simple solution to writing effective headlines. That being said, there are a few tips and guidelines to help you improve the quality of the headlines you’re writing for today’s digital environment. Think of every headline as a quick sales pitch. Instead of a 15-minute elevator pitch, you generally have less than 15 words to do so. How do you find the perfect words? First, put yourself in the readers’ shoes – would the words I’m using motivate me? Use emotive words that will differentiate your headline and grab peoples’ attention. You have a finite amount of time to draw a reader in, and if your headline is too generic or technical, you’re losing your potential audience with every additional syllable. I can’t tell you how many headlines I’ve read where the writer is trying so hard to be funny or witty—so much so that I didn’t even understand the point of the article. Don’t lose sight of the fact that the majority of people don’t have time to waste trying to figure out a pun or joke. There’s success in simplicity. If you use words and phrases that are actionable – wit and humor can take a back seat. To piggyback on my previous point, don’t turn your headline into a wordy, run-on sentence that takes up three lines. The most effective headlines are often the shortest. After writing a batch of headlines, go back and try to remove superfluous words. Most people are too formal in their writing and tend to overwrite. Try to be casual and conversational, not stiff and technical. A passive voice is never a motivating voice. If your headline isn’t interesting, why should anyone be interested? I’ll admit, it’s easier said than done. 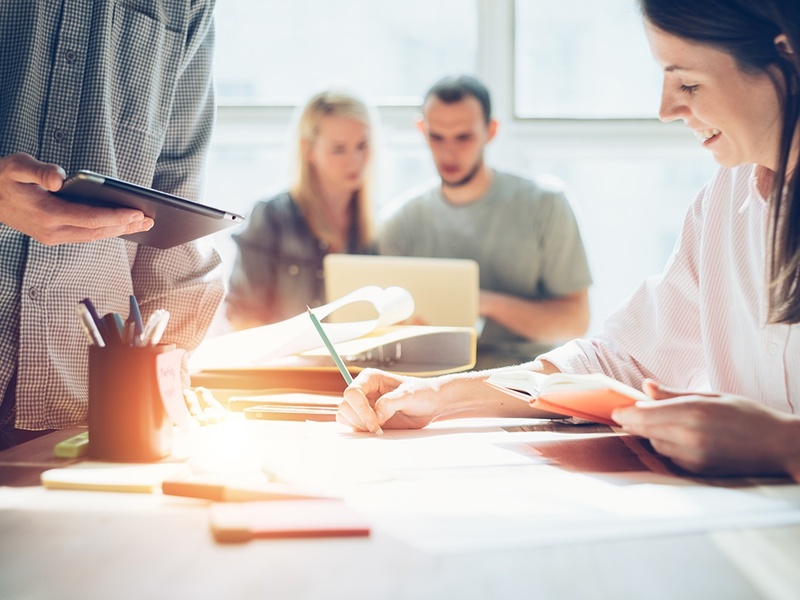 However, adding simple actionable words and phrasing to the headline as a sort of call to action, can have a significant impact on a social post or article’s CTR. 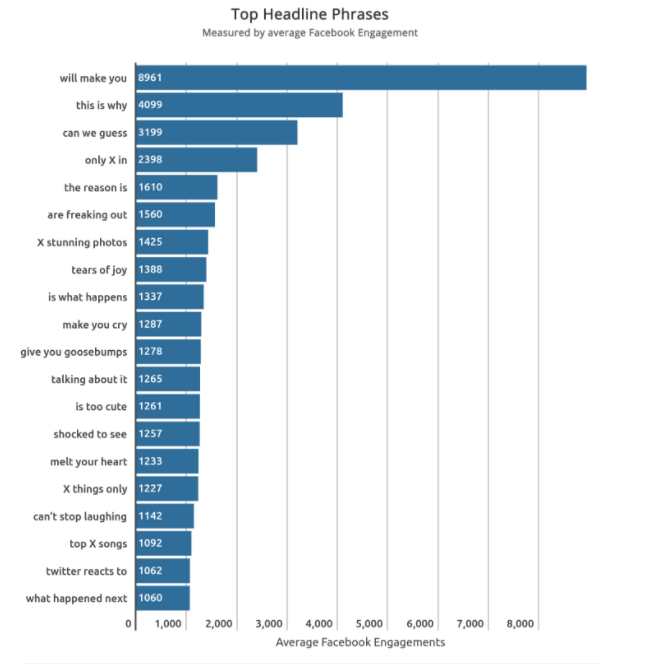 Buzzsumo analyzed 100 million social headlines to see which three-word phrases (trigrams) gained the most Facebook engagement. It should be no surprise that the first headline you write down will most likely be terrible. Don’t be discouraged. It could take 5, 10, 15 or 20 headlines to find the one that clicks (pun intended). A quick way to get your brain buzzing is to pull lines out of the article you wrote that you find intriguing. These sentences can act as inspiration or a jumping-off point for additional headline ideas. Feel free to step away from the writing as often as you need—obviously deadline permitting. I can honestly say that some of the best headlines I’ve written were after I took a break and worked on a completely different project. To recap, social headlines should be short, sweet and to the point. Your job as a writer is to entice and motivate people through words—always keep that in the back of your mind. If you’re unmoved by the headline you write, why should anyone else be moved to click on it? Stick to these guidelines and watch the ‘likes’ start rolling in. What are some of your favorite social headlines? Comment below to start the conversation.